Author(s): Samahe Sadjadi, Majid M. Heravi. Department of Chemistry, School of Science, Alzahra University, PO Box 1993891176, Vanak, Tehran, Iran. Polyoxometalates (POMs) and their hybrid systems are green and efficient catalysts which have found a wide range of application, due to their outstanding properties such as high thermal stability, Redox potential, strong Bronsted acidity, non-corrosive nature and sensitivity to electricity and light. They are able to catalyze various organic reactions as well as being involved in photocatalytic processes. In this review, we try to highlight the recent advances (2009-2015) in the applications of POMs both in their actual structural forms and in the form of hybrid/ composite as catalysts in divergent chemical processes including, organic synthesis, biomass conversion, petrochemical processes, photocatalytic degradation and fuel cell. 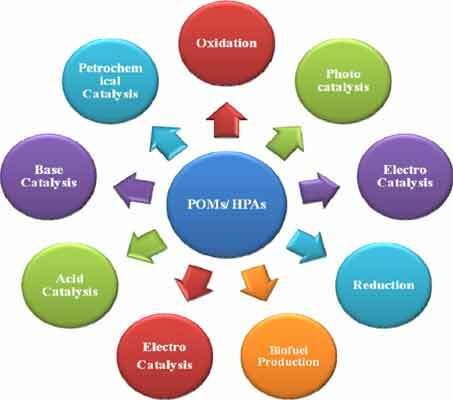 Keywords: HPAs, HPA, POMs, PMOs, catalysis, organic synthesis, biomass, fuel cell. Keywords:HPAs, HPA, POMs, PMOs, catalysis, organic synthesis, biomass, fuel cell. Abstract:Polyoxometalates (POMs) and their hybrid systems are green and efficient catalysts which have found a wide range of application, due to their outstanding properties such as high thermal stability, Redox potential, strong Bronsted acidity, non-corrosive nature and sensitivity to electricity and light. They are able to catalyze various organic reactions as well as being involved in photocatalytic processes. In this review, we try to highlight the recent advances (2009-2015) in the applications of POMs both in their actual structural forms and in the form of hybrid/ composite as catalysts in divergent chemical processes including, organic synthesis, biomass conversion, petrochemical processes, photocatalytic degradation and fuel cell.